Restaurant, Stores, Bars | ¡VidaMaz! We don’t “do” reviews, per se, but when a place really captures our fancy, we might write about it. You are more hipster than me if you have heard about Nitro Coffee, invented in 2012 and evidently taking the world by storm. I’d never even heard about it until this morning at the Mercado Orgánico, where Rico’s Café had an icy cold keg of the nitrogen-infused, cold-brew coffee that’s creamy, frothy, and a beer lookalike. In fact, when Marianne (owner of Rico’s) offered me a glass, I told her I couldn’t drink alcohol so early in the morning! I normally drink coffee with cream, but Nitro Coffee is so smooth that I thoroughly enjoyed it served black. It was almost like drinking a glass of Guinness, but with a caffeine kick! Rico’s is not yet offering Nitro Coffee at their cafés, but it will be at the Mercado Orgánico, and I suggested they make it available by the keg for private parties (I was sad not to be able to get a keg of Tres Islas Beer for the holidays, but fortunately for them demand outstripped supply). By the way, Rico’s is planning to get their expresso machine to the Plaza Zaragoza so we can enjoy their organic, local-roasted coffees any way we want them. They just need to figure out the electricity and water situation, which is taking a bit of time with the turnover in municipal government. New Eats to Check Out! Then, in late August, he started titillating us. “Coming soon!” “Próximamente!” “Cada día estamos más cerca!” What? What was coming soon? What was I waiting for? I could tell from the pictures that he was making wine—his own label, artisanal wine. As if great food weren’t enough? Despite the fact that he never said, “We’re open!”/”Ya abrimos,” I got Greg to head up towards Marina El Cid with me today to check out Jaime’s Casita María in the new food truck area, La Trockería. Luckily for us, Jaime was there, getting set up for his soft opening this evening. He was embarrassed to have me take his photo, as he wasn’t dressed for work; we caught him setting things up. Even though his kitchen wasn’t ready, Jaime greeted us, explained his menu, and gave us a tasting of his white and red wines. They are both sweet but so refreshing; the red is a mix of Cabernet and Tempranillo, the white a blend of Chenin Blanc and uva de mango. There is nothing “mango” about the white wine, so I assume that is just the name of a grape variety. The wines are made for Jaime by a friend who owns a vineyard in the Guadalupe Valley. Despite not yet being open, Jaime proceeded to cook us up a cazuela of mushrooms. OMG! They were awesome! His food truck menu is obviously simpler than the full Casa María menu. He’s aiming for that homemade Mexican taste, with two different cazuelitas or casserole dishes, one with octopus and the other the mushroom dish we ate; and a tuna tostada with Moroccan spices. Jaime gave us a taste of the spiced tuna that goes on the tostada, which he explained was not yet fully marinated. Even half-marinated, it was GOOD! He will change up the menu regularly, and he’s planning to add more of his artisanal wines, as well. Casita María officially opens at 6:00 this evening, and will be open evenings Wednesday through Sunday (Monday and Tuesday off). We had the honor of being his first customers! It is located in the new food truck area just south of the bowling alley, across from Marina El Cid. 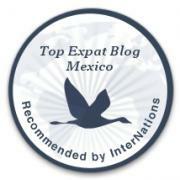 The official address is 1802 Marina Mazatlán (Camarón Sábalo). Also in the Trockería food truck area are 4to Burguer from the Machado, the hot dog van that used to be in front of Gavias on the malecón, a shrimp place, hot wings, and a taco truck. Provecho! And mucho éxito to Jaime and Casita María! Greg and I were looking for a simple, local place yesterday, as it was a bit too cloudy for our traditional “Palapa Friday” on the beach. Greg had run errands in the Golden Zone the day before, and a very energetic abuelita had invited him into her restaurant. The place looked interesting and seemed to have a great menu, but he had just eaten. So he promised the lady he’d be back. We went today, and the place is called El Molcajete Loco. 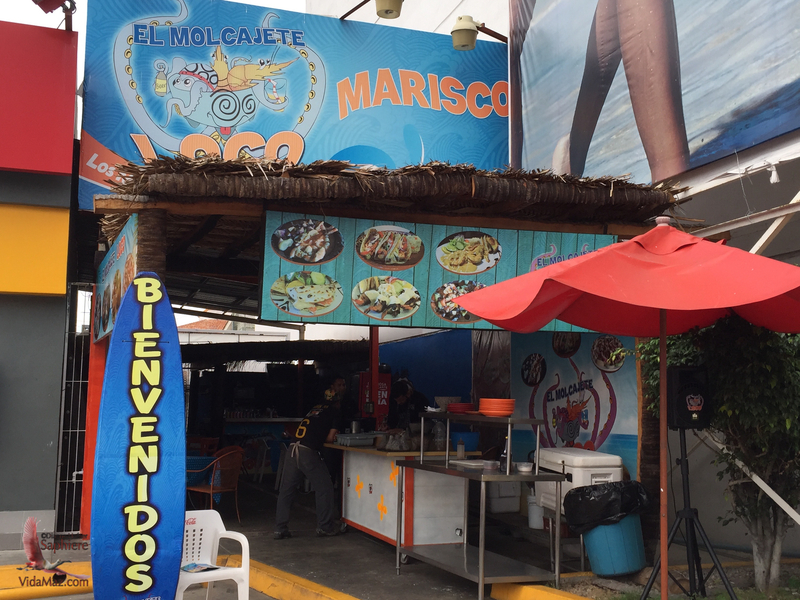 It is located right next to the Oxxo on the northbound side of Camarón Sábalo, across the street from the Cinemas Gaviotas movie theater near Valentino’s. They have a raw bar street side with all the seafood you might expect (scallops, oysters, clams, shrimp, octopus), the expected local seafood dishes (ceviches, aguachiles, cokteles), cold and hot molcajetes (served in lava rock/pumice), plus they’ve got a cooked menu that offers some unique and very tasty items. Click on any image to enlarge it or view a slideshow. We sampled two things we’d be hard-pressed to find elsewhere. Greg had dorado/mahi mahi served over a grilled pineapple slice and covered with poblano sauce, and I had a dorado filet covered with seafood and a coconut cream curry. There was so much food that I ended up bringing half home with me, but never ate it for cena as I was still full! Christian is the chef. 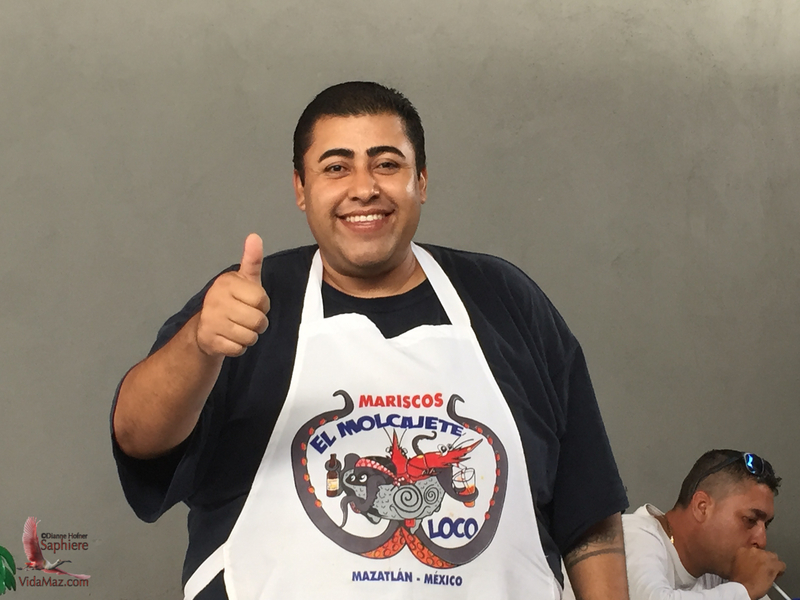 He told us he worked in a restaurant in Bakersfield, California; when he returned to Mazatlán he worked at Señor Frog’s, and then came to the Molcajete Loco. He obviously knows how to make sauces! There were three young men waiting tables, plus the lady Greg had met the day before who keeps things clean, and we were attended like royalty. The owner was not around during our visit. If you like local, simple places with good food and value, El Molcajete Loco is a solid choice. It is open-air, rustic, with the kitchen at the rear. In addition to beer they offer a good selection of non-alcoholic drinks, including agua de jamaica, horchata, piñadas, naranjadas, congas, and limonadas.